@cwodtke Would you recommend that a company has only one top level objective? Lukas asked me a series of smart and frequently asked questions. But there are conversations you cannot have on Twitter in 140 character bites. This is one. Whether I’m coaching onsite or having a Clarity conversation, getting to one objective is nearly always the hardest talk I’ll have with a team. I called my book Radical Focus and not “A Guide to OKRs” because I believe focus is the thing that makes the difference between excelling and flailing about in mediocrity. OKRs are just a framework for creating and ensuring focus on what really matters, but not if you stuff them full of every single business-as-usual initiative you have going. OKRs are not a way to control the way your employees spend their time; it is a way to share your vision so they can make their own judgement calls. The problem with multiple OKR sets is that complexity increases exponentially. Let’s say the company has 5 OKR sets. That means the company is asking everyone to keep in mind 20 pieces of data (five objectives and 15 key results). But wait! Each team as a few OKR sets, let’s say 3. 3×4 is 12, now each employee has 32 things they have theoretically memorized and live each day. But wait! 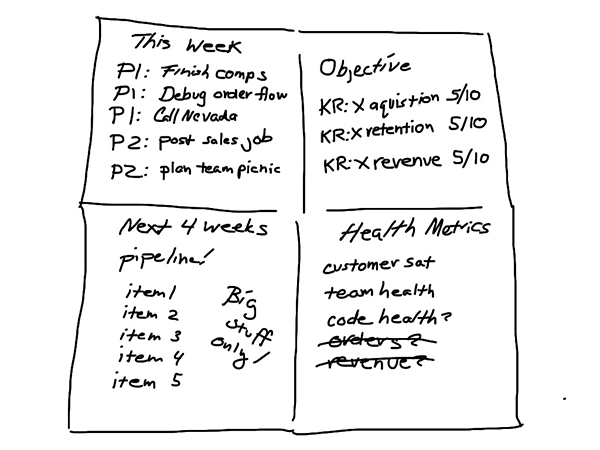 Are you doing individual OKR sets? Add in 4 more, minimum. Objectives paint a picture of success, Key Results tell you when you’ve arrived. Companies adopt OKRs because they seek focus and the acceleration that accompanies it. That only happens if every single person in the company knows what the company OKRs are in their heart. Which means they have to remember them. 1. You are jamming years of work into a quarter. Yes, we want it all and we want it now. But if we try to change everything at once we spend a tiny fraction of our time on everything things and progress is infinitesimal. Instead, prioritize and sequence effort for maximum impact. Let’s say that there is a start-up that is going to have to start raising their B-round in Q1 2018 and it is now the end of Q4 this year (2016, FYI). I’ll name this company TinkWorks, for convenience. Let’s pretend I’m coaching them. I’d recommend to them a technique I call 4O’s and 3KRs. First you choose an annual OKR set. TinkWorks’ annual objective is something about being ready to raise that B-round. Next TinkWork’s CEO will theme each quarter with an objective that leads to the desired end state: showing traction in order to raise money. We all know you don’t pour whiskey through a leaky funnel into our flask and hope to get drunk. So TinkWorks’ clever CEO decides that Q1 is all about retention, Q2 is all about conversion and Q3 is all about acquisition, and Q4 she can settle into pitch and roadshow prep. Now that she has a loose roadmap for the year, she settles into to pick the right key results for Q1 with her executive team. Q1 is tightly defined because it’s what is up first. But why waste time carefully picking Key Results for Q2–4 before you’ve gotten all the learnings from Q1? It may turn out there is a better metric to watch, or that something about the retention will affect the conversion strategy. I find picking the right metric and calculating the right amount of growth is a LOT of work. It’s best done just-in-time. You want just enough planning to know what to do and what to watch for, but not so much you are locked into a bad gameplan. Appropriately sequenced objectives create institutional learning. Imagine a team spends a quarter thinking day and night about retention. The next quarter they are profoundly focused on conversation. Do you think their memory was wiped clean? No! retention is now part of the company DNA. You can make retention a health metric if it needs continued monitoring (more on that in a bit). OKRs are stretch goals. They are shoot for the moon goals. But not everything needs to be pushed. Somethings need to be maintained. In Radical Focus, I talk about the weekly foursquare, where you check progress towards OKRs, discuss efforts toward OKRs and monitor health metrics. OKRs do NOT have to cover everything you do, they cover the single most important thing you must exponentially improve this quarter. That said, there are probably some metrics you want to monitor. Revenue, for example. Customer satisfaction perhaps. And often you need to make sure teams are healthy, key hires are made and the code base is not turning into septic waste. So you pick a handful of key metric you want to keep in the green while you are making heroic efforts toward the OKRs. I typically mark these green/yellow/red. Green means all fine, yellow means keep a watch out. But red means something critical to the health of our company is in freefall. At this point you call a “Code Red” and prioritize a fix (or finding a path to a fix) over OKR efforts. I recommend keeping your health metrics to a minimum. Three to five is enough. If you are a data driven company, you can hold a biweekly or monthly full metrics review to go full data-wonk. But you still want a very short list of number you can truly live by. Please read the wonderful One Metric that Matters. Maintainance efforts do not belong in your OKRs. 3. You are Making an OKR set for Every Department. Now it gets hard. There are a couple potential causes for this issue. Let’s go through them. The OKR set isn’t really a company OKR set. I’ve seen companies who have a marketing OKR, an engineering OKR and a product OKR as their “company OKRs.” A company OKR should unite the company toward a single goal. To get to that “one objective to rule them all,” I first ask why is that marketing/engineering/product OKR important to the company? How will the company be changed if they succeed? What do these goals have in common? I’m looking for a unifying theme. In the previous example, everything was about getting ready for a round. Maybe all the goals are about moving into a new market, or establishing dominance, securing your lead, etc etc…. If you find an OKR set that really is about the company’s success, other teams will find ways to make it happen as well, from customer service to legal. There are always situations where the most important thing to the company doesn’t need everyone’s full attention. For example, a huge product launch. Your legal team will be needed for a few days to craft a TOS, or broker a deal. The OKR doesn’t tell them how to do their day-to-day business, but it does let them know they should drop everything when they are needed. You do not need to make a special OKR for every department. Maybe legal will decide to set a departmental OKR, perhaps something about contract turnaround time. But when the big launch needs someone to update that TOS, they’ll know it trumps any efficiency effort they are making. We can’t all be Frodo; some of us are Samwise. But Frodo never would have made it up the mountain without Sam. Weirdly, I see this more often than you’d think. If I ask, what is the difference between these two OKR sets, people will often point at the Key Results. At which point I wave my magic wand and give them permission to have five key results and one objective. The rule of three Key results is not a rule. It’s more of a guideline. For reasons stated earlier, you really don’t want too many elements to a goal if you want it to be remembered and lived. But if you only have one OKR set and people can only remember the objective and the key results they can affect, it’s hardly a problem. Other times when asked “what’s the difference” people will shrug and say, “I don’t know.” Then you can combine them or vote for the one you like best. Just don’t turn your inability to decide who wordsmithed the best Objective into confusing marching orders for your team.